Check here for all release announcements, including ebook, print versions, and audio versions of each of my books. 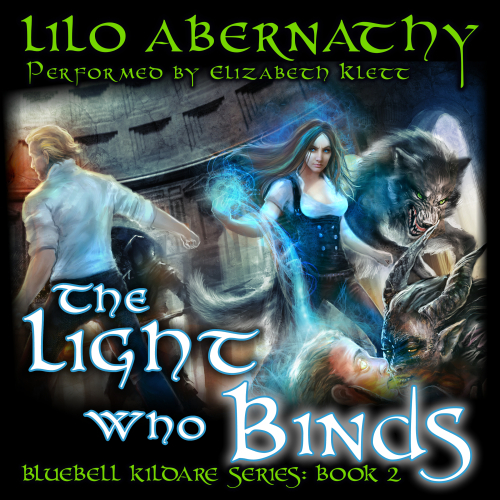 The Light Who Binds: Print and Audio Release! I have some great news to hopefully add a little extra sparkle to your holidays. Actually, I have several pieces of great news. You may or may not have known I’ve had some struggles finding an artist for the series. All of my artist have produced fantastic work, but unfortunately there are other considerations. Is the work commercial enough? Does it grab the eye? Does it have the correct feel for the story? And there are other considerations that don’t even relate to the art. Does the artist handle the licensing promptly? Do we work well together? Is communication solid? I Have A New Artist! Well, I’ve found an artist who seems perfect for the series and who I work with very well. Since I’ve had so many ups and downs with artists though, I didn’t want to announce the work until we had finished a few covers together and I knew it was going well. It’s going very well. Her name is Kirsi Salonen and you can find her portfolio here. She has an amazing Dark Fantasy series that I recommend you peruse for your own enjoyment. The Light Who Shines Gets A New Cover! So the first task was to redo the cover for The Light Who Shines. I wanted it to speak to the romance in the story since I’ve been plagued by a certain set of readers who are unhappily surprised that the plot has a thread of romance. Believe it or not, I don’t want just anyone reading my books. I only want the right readers to read my books . . . that is to say, people who will really enjoy it. Part of the art of getting good reviews is to market your book correctly. Every time I get a complaint that the book has too much romance, I take it to heart. I don’t think, “Oh, I should get rid of some of the romance.” Instead I think, “Oh, somehow I’m marketing to people who hate romance. How do I fix that?” There are some things I can’t control. For instance, I can’t control who sees the book on Amazon, but I can control my book cover. I figured that if I let the first cover of the series speak to the romance that would be enough. Readers would know what to expect. This print version is available on Amazon here. 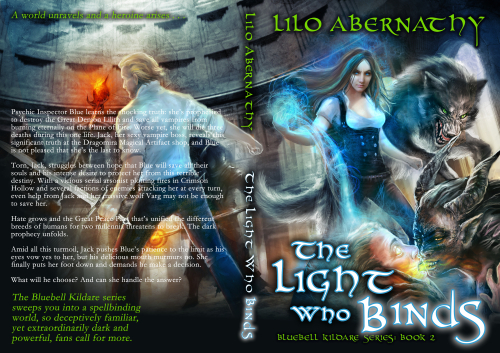 The Light Who Binds Gets A New Cover and is Available in Print! I know some of you dear readers are print only readers and I’m sorry you’ve had to wait. I knew I was going to change the covers and I didn’t want to make you buy one that was of the wrong style. Maybe you aren’t like me, but if I had a set that all matched, except for one or two, I’d have to rebuy those books so I had a matching set. Sadly, I’ve done this before. So, knowing I was going to quickly redo the covers, I just couldn’t do that to you. That’s why the print version for The Light Who Binds has taken so long. I needed the artist to finish the cover first. It’s done now, and it’s glorious! You can see this cover is all about the action. My intention is that the covers for the rest of the series represent a specific scene in the book, most likely one of the focal points of the story. It isn’t all about the cover. One of the wonderful things about being an Indie Author is that I do my own publishing work. It’s hard to find a publisher willing to devote an entire day of someone’s salary to adding special details inside a book. It seems the mass market books have become duller and duller over the years. Rarely do you even get real chapter titles. It’s even more rare to get special fonts unless it’s a special anniversary edition. Well, not so with my print books. 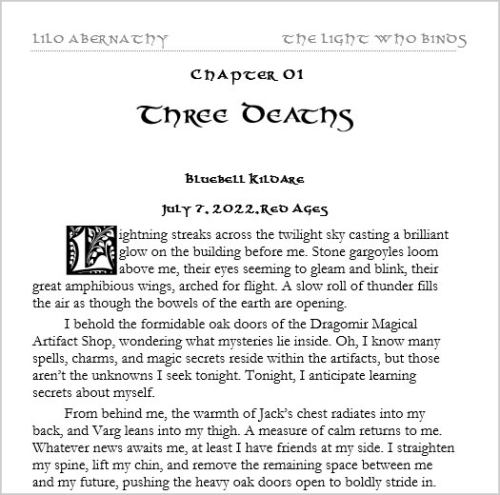 Each chapter has a real title and each chapter header is in a special Celtic font. I’ve also placed gorgeous initial block letters at the beginning of each chapter. Here’s an example. I don’t know about you, but my little book loving heart goes pitter-patter when I see details like that. So I wanted to give it to you all to enjoy. These details are also inside of The Light Who Shines print edition. Unfortunately Amazon doesn’t allow us to use these special fonts in Kindle editions. In this one way, print really does rule. The Audio Edition is Released! Ohh, my dear Readers, I know many of you have been waiting for this. The audio version has just been released and it is available on both Audible and Amazon. It will soon be available on Amazon Whispersync. Now, I may have mentioned this before, but my parents are avid audio listeners. They listen to an audio book for several hours every evening together. So I want to share a tip my father shared with me. I shouldn’t share it with you because it will reduce my profits. But, I find myself compelled to anyway . . . It is almost always cheaper for you to buy the ebook version and then pay the extra for the Whispersync version than to buy it straight on Audible. However, if you are an Audible member and you have the credit system, then you should compare the costs. It is still usually cheaper to go with the ebook version/Whispersync than to use one of your Audible credits. The Whispersync version of The Light Who Shines was going for only $1.99 last year, so it was definitely better to go that route than to buy it straight on Audible. The Whispersync version should be available any day now, but definitely within the next few weeks. I’m telling you this because my narrator, Elizabeth Klett, is a master of voices. It’s amazing what she does with the characters. I think it’s a performance that is not to be missed. Yes, I used the same narrator for The Light Who Binds as I did for The Light Who Shines. You can get the Audible version here. You can read a five minute sample of it here. Just click on the link below the book cover. Just a reminder: It is so helpful to me when you give my books a review. Not only do other readers use it as a guide on what to purchase, but Amazon determines which books are most well loved based on the number of reviews and that makes a big difference to the amount of exposure they are willing to give me. Even a short review really helps. Cover Reveal and Release Parties Announced for: The Light Who Binds! Big News: The audio version of THE LIGHT WHO SHINES is released! 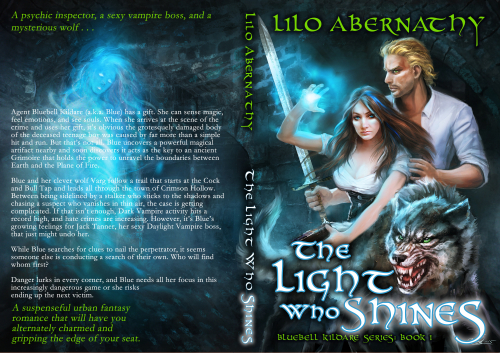 COVER REVEAL: The Light Who Shines gets updated! News: The Light Who Shines Now Available in Print! New Release: The Light Who Shines!